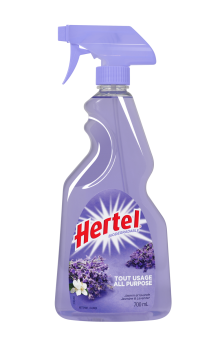 Hertel All Purpose Spray is versatile and specially designed to clean your whole house. It easily dissolves grease and eliminates dirt. Keep a bottle handy to clean and freshen various household surfaces every day. Biodegradable and phosphate-free, Hertel All Purpose Spray leaves a fresh, clean scent throughout your home. The gentle caress of jasmine in perfect harmony with a murmur of lavender will fill you with calm and serenity. A lasting daydream that pampers you with its tender, sophisticated perfume. Keep a bottle of Hertel All Purpose Spray handy to clean and freshen various household surfaces every day. In addition to removing dirt, it leaves a fresh, clean scent that you’re sure to enjoy! Use one of the Hertel All Purpose Spray fragrances for your weekly cleaning. With their versatility and exhilarating scents, these products enhance the time you spend on this chore! Use Hertel All Purpose Spray to clean and freshen your kitchen pantry and cabinets.